Subjects and Themes(Dreaming): Awelye, Honey Ant & Mountain Devil Lizard, Bush Medicine Leaves. region in Central Australia. She was born at Woola Downs, her mother was siblings with the famous Petyarre sisters (Gloria, Kathleen, and Ada to name a few). Whilst Margaret did spend time on her traditional homelands as a young child she has spent the majority of her life living in Alice Springs. As a child she attended Ross Park Primary School and whilst she does return to Utopia at times she primarily resides in Alice Springs were she is a well known figure of the community. Margaret has been painting for the majority of her life. She was introduced to painting during “Awelye” ceremonies. As a tribal woman Margaret would often be involved in the body painting that is involved during these women’s ceremonies whereby the women will apply an ochre paste (traditional paint) to their upper bodies, chest, breasts and shoulders. Awelye ceremonies are a significant feature for Anmatyerre women and involve ceremonies and rituals to pay homage to their ancestors and Dreamings. 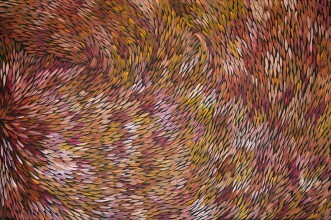 Margaret is well known for her “Bush Medicine Leaves” Dreaming paintings; they are vibrant, full of colour and give you the impression of moving leaves in the desert. 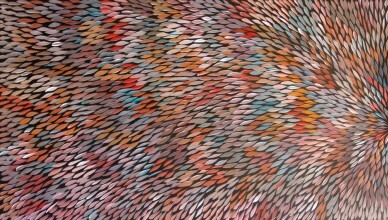 Whilst her artworks are not considered collectable they are extremely popular. 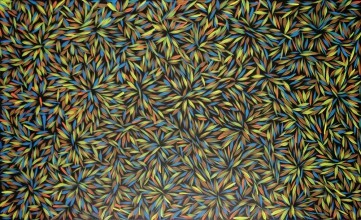 Other subjects sometimes covered in her paintings involve the Honey Ant and Mountain Devil, although these are not as popular as her Bush Medicine Leaves. The Bush Medicine Leaves depict the leaves of particular plants which Aboriginal women collect from the Utopia region in Central Australia. The leaves contain medicinal properties and are used for traditional bush medicine. The leaves are boiled and Kangaroo resin added and made into a paste. This is then used to treat wounds, cuts, boils and rashes. This traditional medicine is paid homage during Awelye ceremonies. 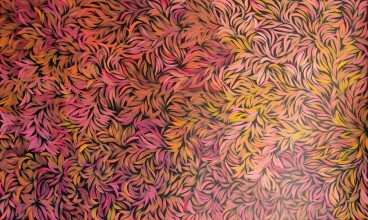 Margaret’s paintings are a good alternative to art lovers who appreciate her technique and the beauty of her artworks without having the collectability or price of much more highly sought after artists such as Gloria Petyarre, Minnie Pwerle or the famous Emily Kame Kngwarreye – other female artists from the Utopia region.